Award Year: 2005 Genetics and genetic testing are often discussed as revolutionizing modern medicine, but so far this revolution has largely occurred in the world of medical care for pregnant women and newborns. Co-investigators Barbara Katz Rothman, Ph.D. and Rachel Grob, Ph.D. examine the expansion of genetic screening and testing for pregnant women and newborns, the differences between optional services and mandatory screening requirements, and the unintended consequences of screening and testing. Their project, Heel Sticks and Amnios: Disjunctures and Discrepancies in Prenatal and Newborn Genetic Screening, considers a number of controversial issues, including whether it's useful to screen for rare or untreatable conditions; the lack of informed consent, counseling and follow-up in newborn screening; effects of testing and screening on families; and the various forces that are shaping public policy in this area including the influence of emotional appeals from parents of affected children. 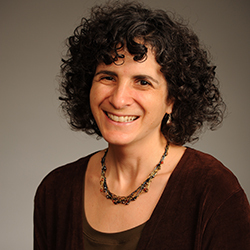 Rachel Grob is the new Director of National Initiatives for the Center for Patient Partnerships and Scholar in Residence at University of Wisconsin - Madison. For the past eight years she has been associate dean of graduate studies, director of the Child Development Institute and a faculty member in the Health Advocacy Program at Sarah Lawrence College. Dr. Grob?s scholarship about the theory and practice of advocacy is extensive, and includes collaboration with an interdisciplinary team of scholars to conceptualize and articulate a set of principles about how patients? diverse voices can best be incorporated into democratic deliberation about health policy. She holds a B.A. from Wesleyan University, an M.A. in Health Advocacy from Sarah Lawrence College, and a Ph.D. in Sociology from the CUNY Graduate Center. Prior to joining Sarah Lawrence full-time in 2003, she worked for ten years in the public and then in the private sectors doing community coalition building, public health advocacy, policy analysis, and health and human service program management. She has worked with a variety of private foundations -- as a consultant, grant recipient, and/or principal investigator -- including the Annie Casey Foundation, the Ford Foundation, and the Surdna Foundation. She is author of "Parenting in the Genomic Age: The Cursed Blessing of Newborn Screening," New Genetics and Society, 2006; "Celebrating and Mobilizing: How We Started a Family Day in Yonkers," America's Family Support Magazine, Spring 2000; co-author of "Educating for Advocacy," in Patient Advocacy: Patient-Centered Strategies for Improving Health Care Quality, 2007 and "Parenting and Inequality," published in The Blackwell Companion to Social Inequalities, 2005. Grob, R. A House on Fire: Newborn Screening, Parents' Advocacy, and the Discourse of Urgency, In Patients as Policy Actors, eds. Hoffman, B., Tomes, N., Schlesinger, M., Grob, R. New Brunswick: Rutgers University Press, 2011. Grob, R., Schlesinger, M. Epilogue: Principles for Engaging Patients in U.S. Health Care and Policy, In Patients as Policy Actors, eds. Hoffman, B., Tomes, N., Schlesinger, M., Grob, R. New Brunswick: Rutgers University Press, 2011. Grob, R., Katz Rothman, B. Parenting and Inequality, In The Blackwell Companion to Social Inequalities, eds. Romero, M., Margolis, E. Blackwell Publishers, 2005. Grob, R., Hurst, M., Lieber, C., L. Lewis. Family Stories: Narrative Genetics and Conceptions of Heritability in Pregnant Women. J of Midwifery & Women's Health, Jan/Feb 2011, 56(1): 26-32. Grob, R. Newborn Screening: Guiding Parents Through The Diagnostic Maze. Contemporary Pediatrics, Apr 1 2011, 38-47. Grob, R. Is My Sick Child Healthy? Is My Healthy Child Sick? : Changing Parental Experiences of Cystic Fibrosis in the Age of Expanded Newborn Screening. Social Science and Medicine, 2008, 67(7): 1056-64. Grob, R. Parenting in the Genomic Age: The Cursed Blessing of Newborn Screening. New Genetics and Society, 2006, 25(2): 159-70. Hoffman, B., Tomes, N., Schlesinger, M., Grob, R. (eds.). Patients as Policy Actors. New Brunswick: Rutgers University Press, 2011. Grob, R. Testing Baby: The Transformation of Newborn Screening, Parenting, and Policymaking. New Brunswick, NJ: Rutgers University Press, 2011.